Dorner’s AquaGard 7360 Series Conveyors are part of Dorner’s line of sanitary conveyors suited for wipe down and low pressurized washdowns. 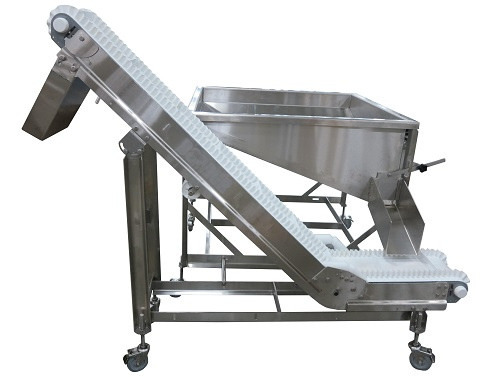 With BISSC certification, these conveyors are often used for industries such as bakery & snack foods, but they are suited for any environment requiring wipe down conveyors. In this application, the AquaGard LPZ conveyor was used to receive product from a hopper. The hopper was holding 9 cubic feet of small bulk metal product. By using the Z-frame conveyor with a cleated belt, the customer was able to move the product to a higher elevation, while portioning the product into the amounts required for the next machine. Learn more about Dorner’s AquaGard 7360 Conveyors.